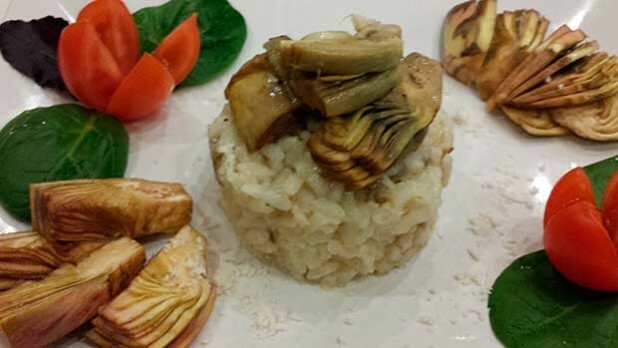 Let’s take advantage of what the countryside offers us this season by creating a simple dish combining the rich flavour of artichokes with rice and a good local pecorino cheese. In a large frying pan cook the onion in the oil until softened. Add the rice and cook until it looks slightly translucent, then add the wine. When this has been fully absorbed, cover with the vegetable stock, turn the heat down and leave to simmer. In the meantime cut the edible part of the artichoke stalk into cubes and reduce to a cream with a little olive oil and a pinch of Parmesan cheese using a blender (this will be the bed for the rice). Slice the artichoke leaves and, when the rice is nearly cooked, add. Stir in the pecorino and a knob of butter and serve on the artichoke cream, with a sprinkling of Parmesan cheese.